If you need a simple, easy but effective way of providing safe and secure storage for your staff, customers, students or guests so that they can easily store their personal belongings and items, then look no further than the simple but effective Locker. 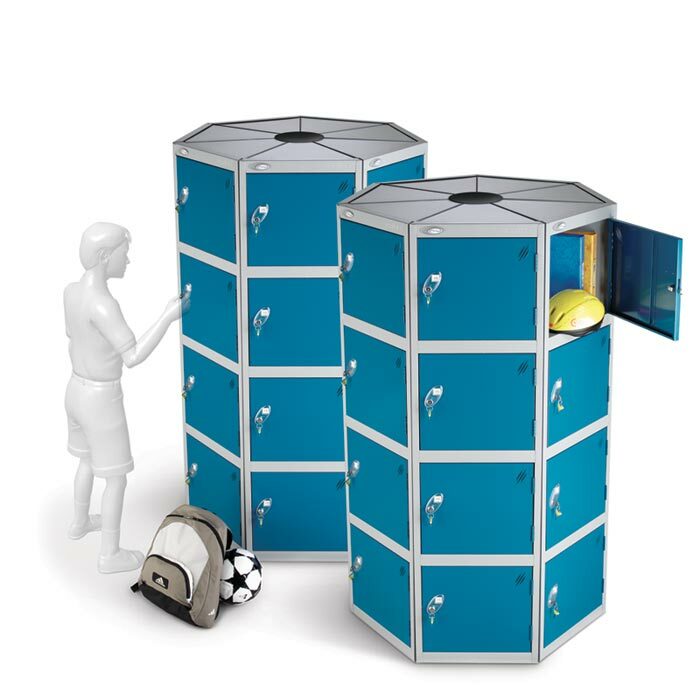 Here at Locker Shop UK Limited we have built up a massive range of lockers that we believe will offer a solution to any of your personal storage needs. Whilst we obviously offer the traditional standard steel locker with steel doors which, with the wide range of colours , sizes and accessory options available, offers an extensive range in its own right, it is only just the beginning of what we can offer. 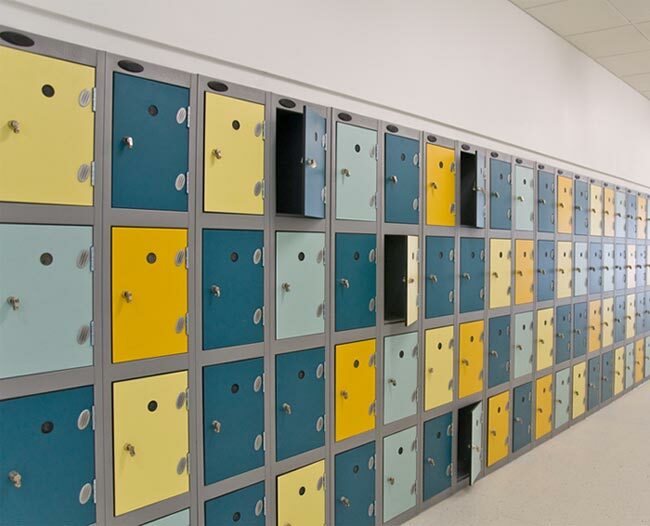 We also have a variety of specialist or bespoke lockers that are designed to address more specific requirements or more specific environments. 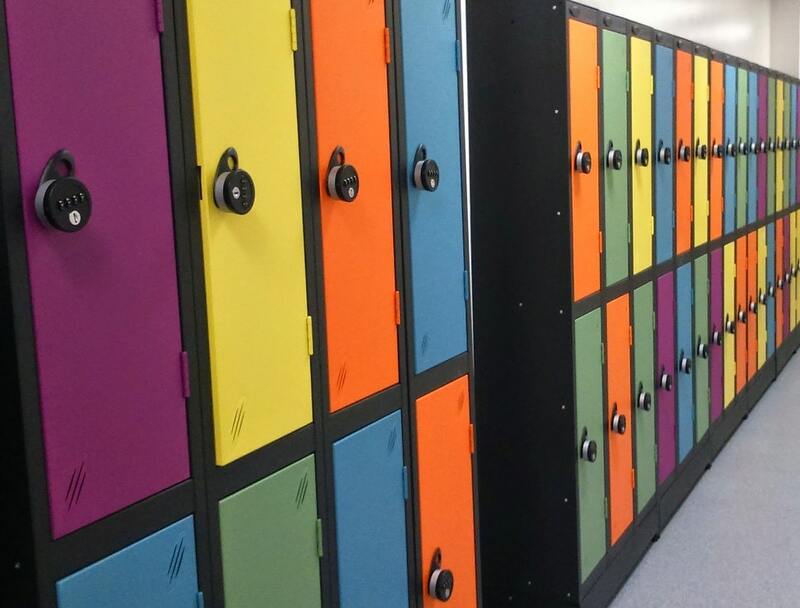 So for instance if you have a wet environment such as a swimming pool or changing room, a harsh industrial environment, need lockers that can be installed outdoors or just need a colourful but robust locker for an educational setting, then we will be able to find the right locker solution for you. 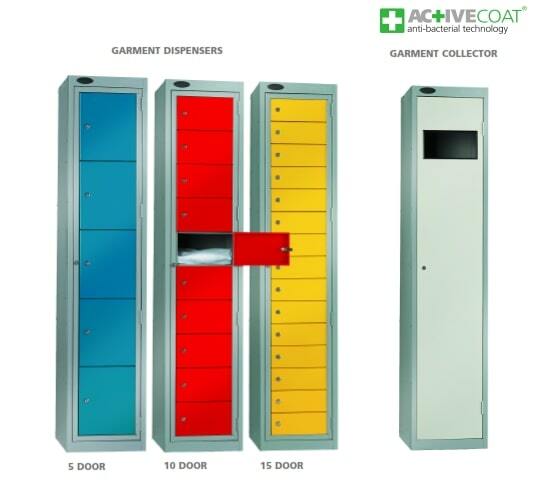 All of our locker products are available in a range of sizes and configurations which means that you can choose from a variety of compartment sizes. We are confident that you will find the size and type of locker to accommodate any of the many items that you need storing. If it’s as small as a mobile phone or wallet, as valuable as a tablet or laptop or as big as a back pack, sports bag or handbag then we have the locker for you. 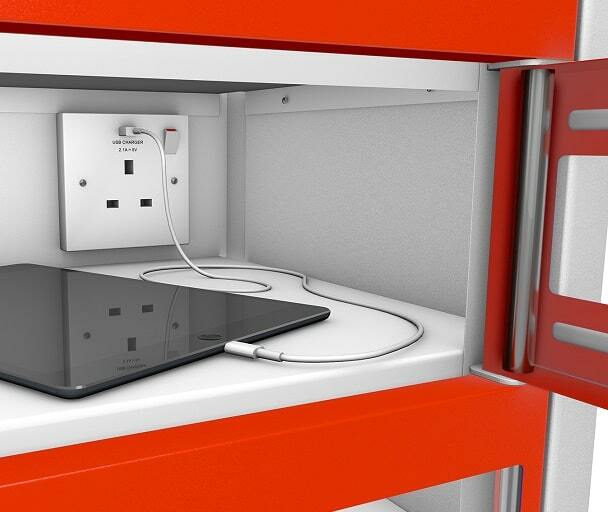 We can even offer lockers that can charge your items whilst they are being securely stored such as power tools, mobile phones, tablets , laptops or other electronic devices. Things to consider when selecting and buying your lockers. OK, so you are in the market for some storage lockers and as we have already said there are lots of options, choices and accessories to consider so we have summarised the main things you may want think about to assist in your selection. What Material do you want the lockers to be manufactured from. 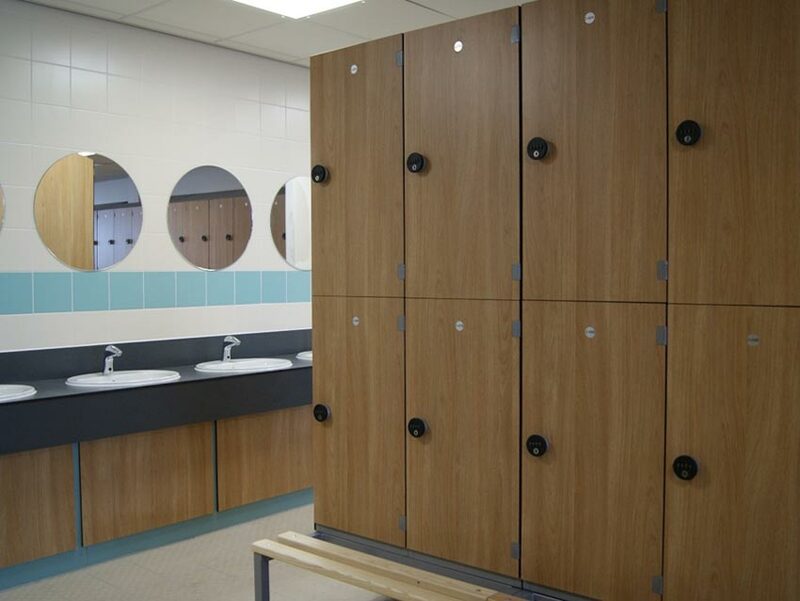 This choice is predominantly dictated by the environment the lockers will be installed in if you are installing your lockers outside where they are exposed to the elements or indoors in a wet environment such as a swimming pool or shower room. 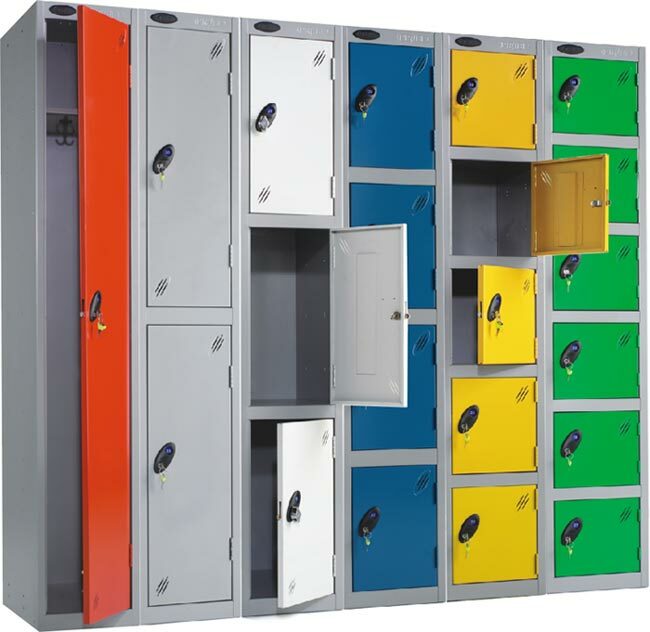 If your lockers are installed inside you could look for the standard Steel lockers with steel doors and they are the most cost effective way to provide storage. 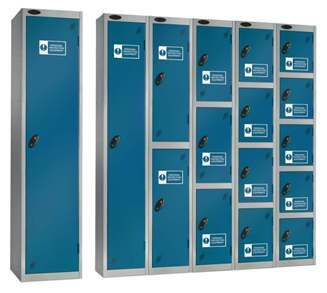 We offer a high quality steel constructed lockers supplied as standard with key locks with an option to upgrade to any of the lock options from combination locks to Coin/Token return. 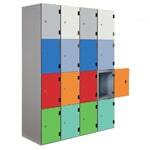 Metal lockers are really most suitable for use in dry indoor areas and are perfect for installation in your staff rooms, school or dry changing room. If you want to add an increased level of strength and resilience to the locker doors you can opt for the “ShockBox” locker which is the standard steel locker body with a Solid Grade Laminate Door. The SGL doors are far more hardwearing compared to steel doors they are Impact resistant, Scratch Resistant, Graffiti Resistant and easy to clean meaning they will provide years of reliable service under more robust use. Available with “Plant On “or “Inset” doors they offer a very aesthetically pleasing installed look. What Size compartment de we need and what overall height of locker do we need or can we fit in to the space we have? 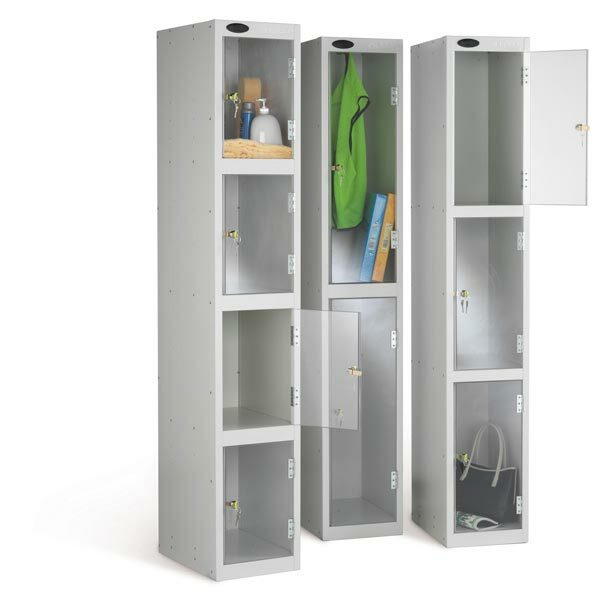 Standard full height lockers are 1780mm or 1800mm high, if supplied without a sloping top, and with locker door options from 1 compartment up to 16 compartments you need to ensure that the users can reach the top locker. If your lockers are for younger children you may need to consider lower level lockers or even consider using or stacking the individual compartment “Cube” and “Quarto” lockers. The next consideration is the amount of space required in each compartment which is simply dictated by the mount of belongings being required to be stored. 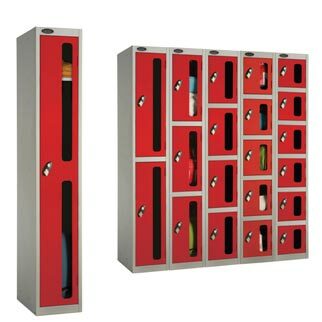 If you require hanging space you will need the single or 2 compartment lockers which are supplied with double coat hooks as standard. Deciding how many compartments each locker will have will also help you decide what space to provide. If you just require staorage for “Personal Effects” we have a range of smaller compartment Wallet and personal effect lockers with 8 or 20 smaller individual compartments. Which Lock should we choose? There are four main different lock types that you can choose from. Standard CAM key locks; which are supplied with 2 keys and you can get a master key which will open all locks. Coin or token operated locks. This means the lockers are used on a “Public Use” basis where your users will find a vacant locker and use a coin or token to get use of the locker Combination locks. Mechanical or Electronic combination locks mean that there are no keys used and hence they cannot be lost. What other accessories can we consider? The most common accessory chosen after the different lock options is the choice of Sloping tops or locker Stands. Sloping tops prevent the user from leaving bags on top of the locker effectively preventing clutter in the locker room and it also means that the risk of items left on locker tops falling on people is removed. Locker stands raise the lockers off the floor so the bottom compartment is more easily accessible or so you can easily clean under the locker. Seat stands are a higher stand with an in built seat bench making it easier to change clothes or shoes whilst using the locker. At Locker Shop UK Limited we are here to help so if you can’t see what you want, unsure what would be the best product for you or just need a bit of guidance with your selection please just call us and one of our experienced team will happy to help.